Facebook recently added the ability to use the emoticons into Facebook comment and sometime into Facebook Status by using Unicodes of Symbols and Emotes. The Unicodes of the Symbols and Emotes will eventually turn to custom emoticons or symbols in Facebook. Watch the video below. To use the Emoticons (also known as Emoji), Symbols in Facebook Comment (and Status), all you need to do is paste the unicodes that we gave you below into your FB comment or status. Note: Most of the unicodes of these symbols and emotes/emoji somehow were not supported by most of popular web browser — Chrome, Chromium, Opera, or IE — that why you might only see a square(s) (ex: ), but just copy the square(s) and paste to fb comment. As usually, month of December is a month with two global ceremony that we waiting for. Almost billion of people are going to celebrate: The Christmas Day of 2012 dan New Year of 2013. 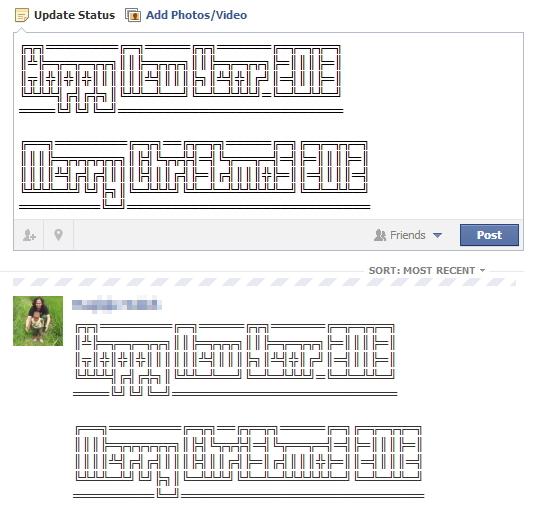 After we gave you a year ago how you could enjoy this days in Facebook or Google Plus, now we gonna give you one again how to celebrate it with ASCII Art. All you had to do just copy paste the ASCII Art that we have specially designed below to your Facebook Status, Facebook Chat, Google Talk, Skype, Facebook Page Status, Facebook Comment, Facebook Group, Google Plus Comment, Google Plus Status Stream, Google Plus Page and others. We ever wrote in the older post that in order to make your invisible to only some of chosen friends on Facebook Chat, you need to create a group of chat and the turn in on / off manually. 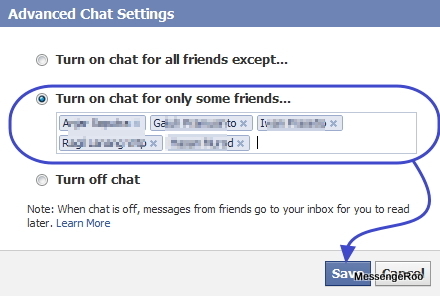 This trick doesn’t work anymore because FB chat have rolled out new user interface and design. But this time another upgrade from Facebook Chat teams make this “visibility option” can be done again. It called as Advanced Chat Settings Friends Availability / Visibility ( See the image below). By having this feature, you will be able to determine which ones of your folks that you gonna let to see you are online and which ones that you not gonna let to see it. It also provides the ability to make all your friend see you being online but added the exception for others. The fastest way to add to this list would be by adding the listed / groups that you already had (in Google Plus it called “circle”). It would avoid manually adding friends one by one that will take too much time to do that. I just noticed that the newest version of Facebook for Android version 1.9.8 is now available for Emoji / Emoticons on its Chat / Messages. This new version of FB For Android also supports adding photos to messages. Unfortunately, the complete list of Facebook Chat Emoticons still need to be added gradually. It because we found that there are so much FB chat Emoticon / Emoji shortcut key that didn’t work on the Chat Messages. For example the Smile, putnam face, shark, 42, glasses, devil and more. I just found an interesting news regarding with Facebook Chat for Desktop Client. 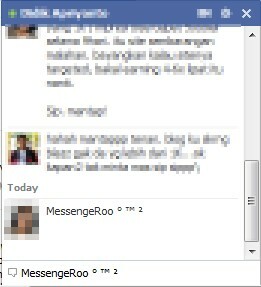 Right now, Facebook, officially developed a Desktop Client for FB Chat called as Facebook Messenger. At least it is what we heard from the official page of FB Messenger help center at here. This PC Software Client for FB Messenger works under Windows Operating System (Windows XP, Windows Vista and Windows 7). Not sure when the version for iOS, Linux or others OS would available. How to Downgrade your Yahoo Messenger?